Colorful paper butterflies make charming, spring- and summer-inspired home decor. Use vibrantly hued paper to add a pop of color to any space in your home. 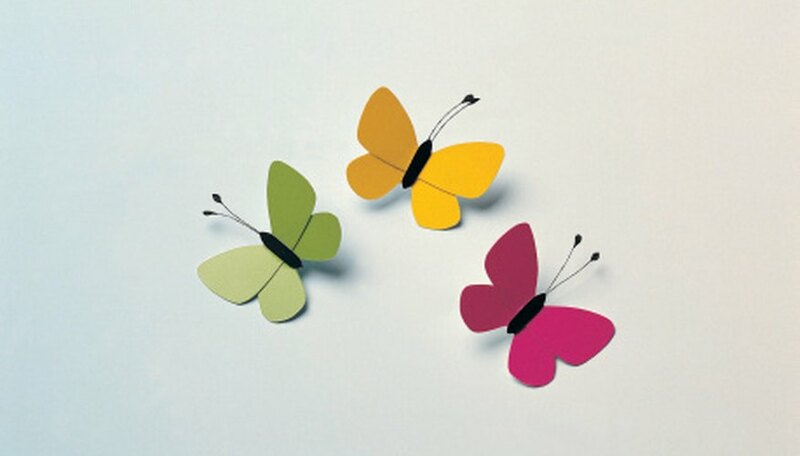 Suspend the whimsical butterflies from windows using transparent line, or stick them on your refrigerator door. You can also use the crafts to enhance bug-themed children's birthday parties. Have the kids make the art projects as a hands-on party activity. All you need to complete the craft are a few basic craft items and a dose of creativity. Fold a colorful, 8 1/2-by-11-inch piece of construction paper or cardstock in half lengthwise. Draw half of a butterfly shape, including two curving wings and an antenna, on one side of the folded paper, using a pencil. Cut the butterfly shape out of the paper with craft scissors. Unfold the paper to reveal a whole butterfly shape. Glue a black pipe cleaner or a black-painted wooden craft stick down the center of the butterfly as its body.